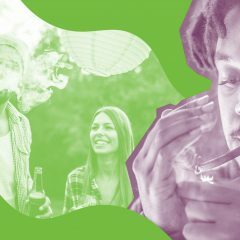 on Wednesday, Oct. 26, 2016, in Sacramento, Calif.
SACRAMENTO — The leading advocates for Proposition 64, the California initiative that would legalize and regulate the adult use of cannabis, are well known: Gavin Newsom, the dashing lieutenant governor; Sean Parker, the tech startup billionaire; and Jay Z, musician and general mogul. That would be John Lovell. Lovell is a longtime law enforcement lobbyist who’s emerged as one of the leading voices against legalization in the nation’s largest state. Lovell says he’s concerned that the initiative could potentially support the rise of Big Pot by allowing businesses to hold multiple types of licenses—grower, extractor, retailer, and so on. He also worries the proposition doesn’t go far enough to control the potency of the various products, won’t be sufficient to prevent impaired-driving fatalities, and leaves the door open for individuals with past drug convictions to receive business licenses. 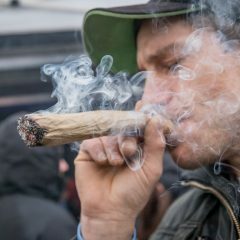 The measure’s proponents counter that limits on large-scale grows for the first five years after legalization would help give small businesses a leg up. They point to a planned $3 million for California Highway Patrol to develop protocols to detect and deter impaired driving. And they say the possibility of licensing individuals with past drug convictions is a social-justice feature, not a bug, meant to bring people into the legal market and undo the racially-tinged ravages of the drug war. His arguments, he says, are based in part on a public health report by tobacco researchers at the University of California San Francisco. 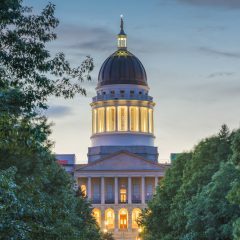 It raises a number of policy questions around legalization, concluding that the state ought to “proactively create sensible and necessary regulations, oversight, and enforcement, related to the production, sale, taxation, and marketing of retail marijuana.” In other words, the report says the state should legalize—but legalize carefully. That’s something, Lovell says, that Prop. 64 fails to do. He contends that the entirety of the proposition was designed primarily for profit rather than public safety, by people with an interest in what’s expected to be an enormous cannabis economy. Lovell has often been involved in policy conversations around cannabis. 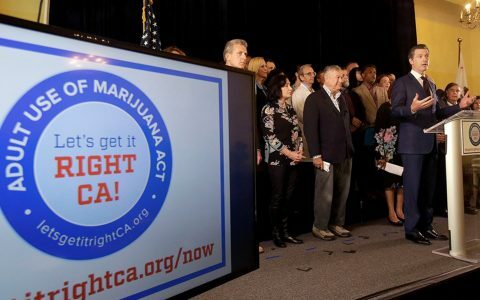 He worked against Proposition 19, a 2010 voter initiative that would have legalized marijuana for adults, because he felt it didn’t do enough to prevent the dangers of having a mind-altering substance on the legal market. 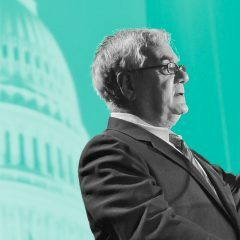 But he’s also worked constructively on marijuana legislation such as last year’s Medical Cannabis Regulation and Safety Act, or MCRSA, a set of bills passed in 2015 that will establish a statewide licensing system for medical cannabis businesses, create environmental and product testing standards, and allow counties to impose taxes on cannabis businesses. 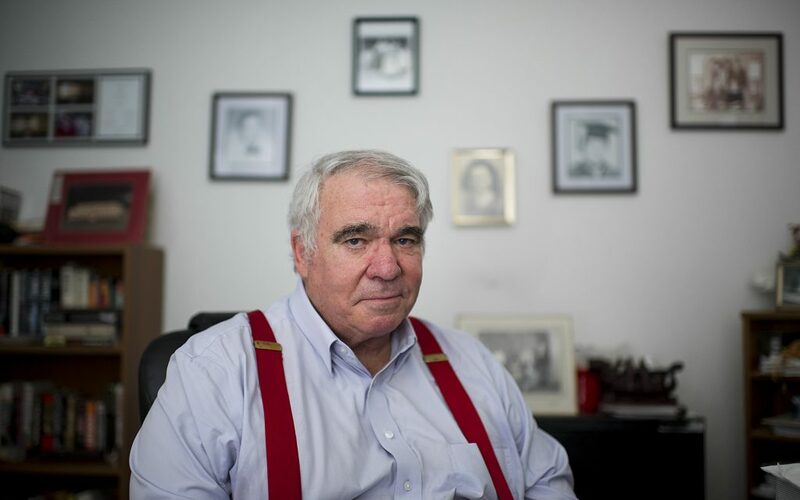 Lovell’s small office is cluttered with books—volumes about Vietnam, Moscow, one called Steroids 101—and hung with photographs, mostly of family. 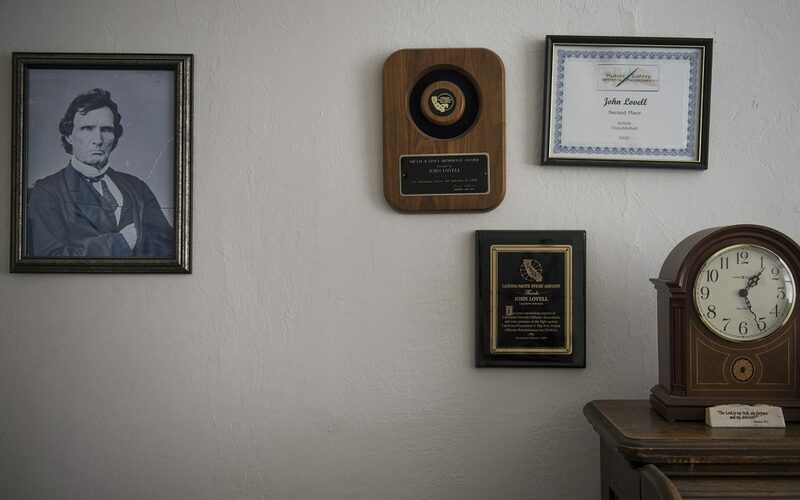 But also on the wall are pictures of a man Lovell’s never known, the victim of a Los Angeles mass murder. The slayings happened in 1957. Three men were thrown out of a bar. They returned with a five-gallon can of gasoline, which they threw into the bar and ignited. Six people were killed. Lovell remembers reading about the event in the newspaper as a precocious 10 year old. He was so disturbed, his father suggested he stay away from papers for a while. Years later, when Lovell met the woman who would become his wife, he learned her uncle and uncle’s cousin were two of the victims. 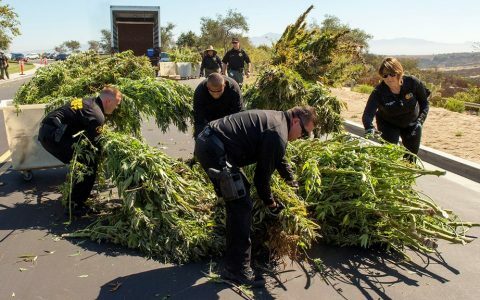 When it comes to marijuana policy, the question of who the victims are occupies a lot of minds in California these days. Proponents of Prop. 64 say they want to stop creating new victims of America’s failed war on drugs. Lovell sees it differently. He believes Prop. 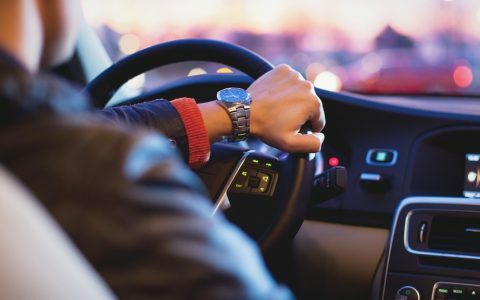 64 will produce new victims: casualties of impaired driving, minors enticed by cannabis advertising, and just about anyone who gets in the way of a booming industry. Lovell worries that Prop. 64 would create one more Big to join the other Bigs: Tobacco, Alcohol, Pharmaceuticals, Agriculture. 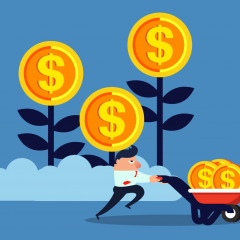 Huge companies could eventually push out small operators. And those same massive players, he warns, could also wield the political influence to prevent regulatory revisions down the road. Under Prop. 64, large-scale cultivation licenses couldn’t be granted under until 2023. 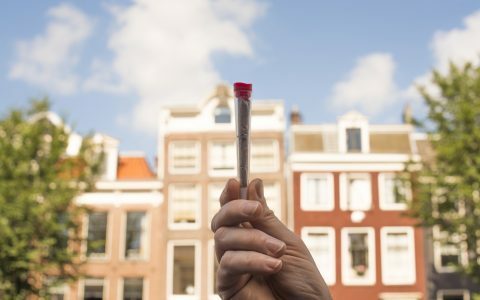 But because the measure generally doesn’t limit how many licenses a potential operator can obtain, a single company could control almost every step in the supply chain, from planting the seeds to sealing the packages to selling the products in stores (a third-party laboratory would need to test the products for potency and pesticides). The vertically integrated model is one that Colorado originally adopted for its regulated medical marijuana system. 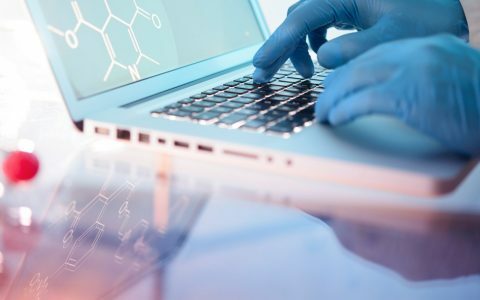 It was seen by state officials as a way to assure regulatory compliance. Washington state’s law, by contrast, bars vertical integration. Another key plank of Lovell’s anti-64 platform is that the proposition doesn’t include an all-out ban on advertising to children—a point that has been debated and litigated. 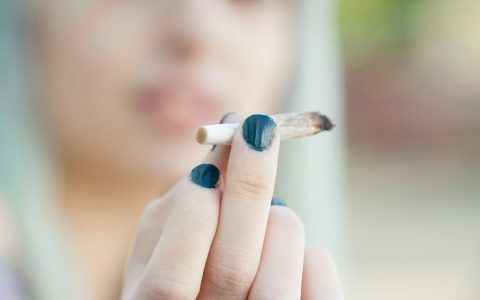 The text of the law explicitly prohibits marketing to people under 21 or near schools and forbids marijuana products that could be mistaken for candy. There are strictures against advertising and sales near schools and requirements that sellers verify age, as well as requirements for product labeling and marketing that don’t currently exist. But, Lovell says, that doesn’t mean ads would necessarily be out of the question. A provision of the measure says they can only be displayed “where at least 71.6 percent of the audience is reasonably expected to be 21 years of age or older,” a rule adopted from an alcohol-industry guideline. Meanwhile, marijuana-product websites would require that visitors verify their age, which as anyone who’s used the internet knows is a pretty simple workaround. For many, marijuana legalization is a social justice question. Lovell isn’t in favor of criminalization. “Do I smoke marijuana myself? No,” he says. “Do I feel that someone who uses marijuana should be incarcerated? No.” He points out that marijuana possession in California has been mostly decriminalized since 2011, with possession of up to an ounce subject only to civil fines. Arrests have dropped since then, though they haven’t vanished. Ask Lovell about his idea of a good cannabis measure and he’ll point you to MCRSA, the state’s new medical marijuana law that, once it takes full effect in 2018, will replace the state’s largely unregulated medical marijuana industry. Lovell worked with two of the law’s co-sponsors, the California Police Chiefs Association and League of California Cities. Assemblyman Tom Lackey (R-Palmdale), a co-author of MCRSA, says Lovell’s effectiveness as a lobbyist came from creating trust on both sides. The act, as Lovell describes it, successfully balances consumer demand, business interests, and government oversight. It creates six different categories of medical marijuana operating licenses and, most important to Lovell, attempts to control vertical integration by limiting the number of licenses an operator can hold. Given the current trend of distrust toward other industrial Bigs, it could be an effective strategy to warn of yet another. But if Lovell’s beef with Prop. 64 isn’t legalization per se, what, then, would his ideal legalization measure contain? “There’s a number of things,” he says. 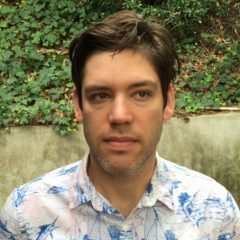 “I think one of them is, yes, limiting vertical integration. Another is limiting advertising. Another is making sure there are some impaired-driving standards built into the bill. Another is making sure that it is relatively easy to amend if there are unintended issues that come up.” While Prop. 64 does addresses some of those issues, Lovell thinks it’s a bad bit of legislation all around. Amid the competing claims and talking points around Prop. 64, there’s one thing Lovell and cannabis advocates can agree on. 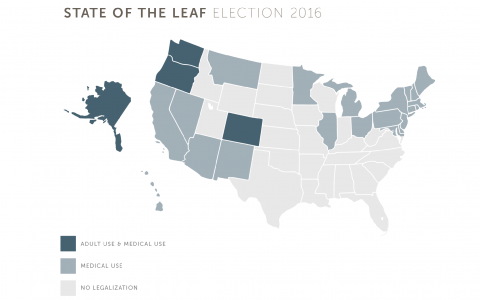 If it’s true that California’s legalization could create the template for national change, it’s well worth looking at closely, now and if it passes. I know there is a reason people looked like that in old photos it’s just funny to me. Actually the photo that you are referencing is Thaddeus Stevens, the great abolitionist Congressman who authored the 13th, 14th and 15th amendments to the Constitution. A long, long way from anything Trumpian. True! And, if you think Hillary is going to legalize Cannabis, better think again! Trump has already said he’d leave it up to the individual states. “Lovell isn’t in favor of criminalization”?! Oh, really; since when? Because this is the guy who’s been pushing LE’s position for years that “marijuana isn’t medicine” and “the Compassionate Use Act [Prop 215, CA’s MC law] was a con job put over on the voters by drug dealers”. And what a coincidence; the “Big Marijuana” boogeyman “con job” that he, Sabet, and Morgan are trying to “put over on the voters” sounds an awful lot like the one certain figures in the medical weed industry have been pushing, too–or maybe not such a coincidence, after all … ! Here in Canada, the LPs (Licensed Medical Marijuana Producers) are positioning themselves to be the Big Cannabis businesses when legalization comes, and appear to want to exclude the small existing operators. Among those LPs is Tilray, which is owned by the same company as Leafly. He makes an excellent point, “if it’s done wrong” The Oregon model looks pretty good and I agree Big Business MUST be kept out of it, through proper legislation. Unfortunately Money IS the problem in politics today, so the Marijuana initiative MUST remain small and well regulated. You know why I love this election I get to recycle articles that I wrote about people like Lovell and the police chiefs. My look at Lovell and how much money he made from the Chief’s and the Narcotics Officers back in 2013 as a lobbyist who has impeded drug policy reform and marijuana reform since the 1990’s. Another liar with a business and an opinion. This man is evil and should be ignored he does not have your best interest in mind. This man would love to put you in jail.